Since its creation, Béton Prestige has specialized in concrete floor polishing. Our team combines expertise, advanced technique and a thorough approach to provide you with the best service possible: an outstanding final result. 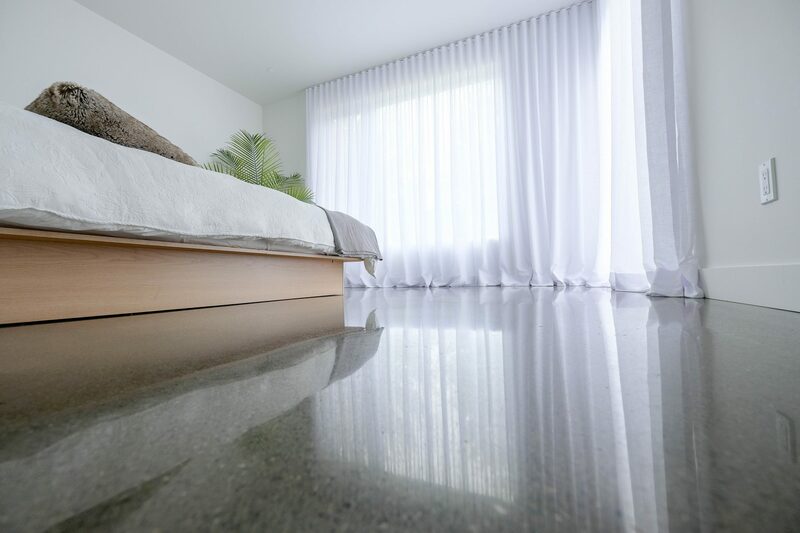 Our polished concrete floors are simply dazzling ! We provide support, from placement of the concrete to polishing. Our approach is simple: we are involved in your project from start to finish. We guide you in your choices, and we complete your polished concrete flooring following good trade practices. Interested in knowing more? Every achievement is a unique creation carried out with careful skill and attention to detail for all projects in the commercial ou residential sector. Pouring and placing concrete must be performed according to the prescribed method. The setup is extremely important for a good result considering that there is nothing added on the floor that would hide defects. In addition, wall edge finishing should be done with a steel trowel since the density of the edges of walls should be the same as the floor in order to have the same « look » of polishing. The defects of the installation will be found in the polishing and will make it irregular.